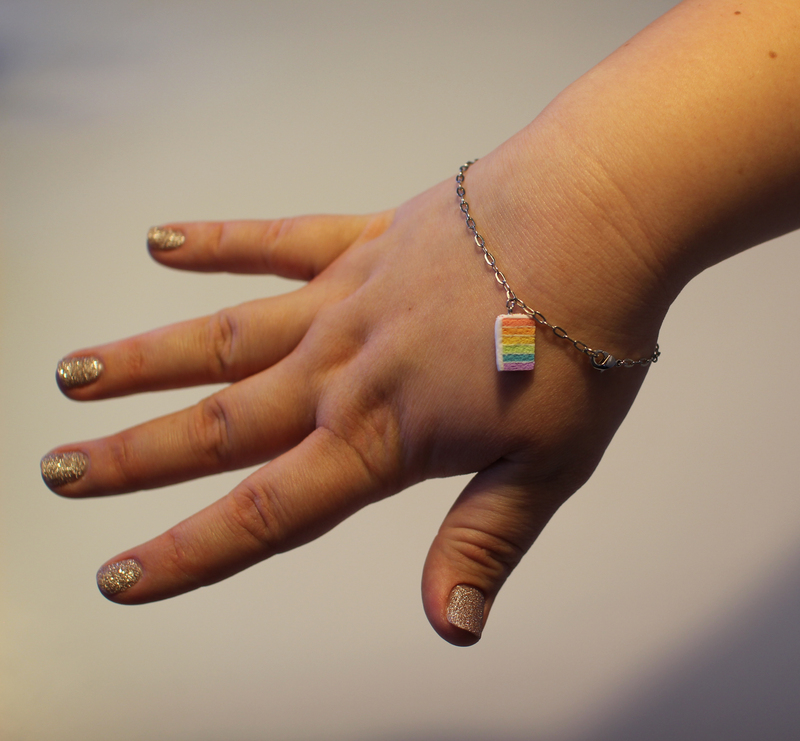 I was the incredibly lucky winner of AiClay’s contest for a beautiful bracelet with a slice of rainbow cake as an appendant. I’m just one of many who have been following Jocelyn (the owner of AiClay) for quite a while. She does this amazing miniature food with such details that you’re usually left speechless! From tiny strawberry tarts to cookies to hotdogs she creates little wonders with her hands. She also makes little “recipes” of how to make a sandwich, and it always makes me smile to see such realistic miniatures. Jocelyn also hosts awesome workshops where she actually teaches people to make these miniatures. Anyone care to buy me a plane ticket to Singapore? 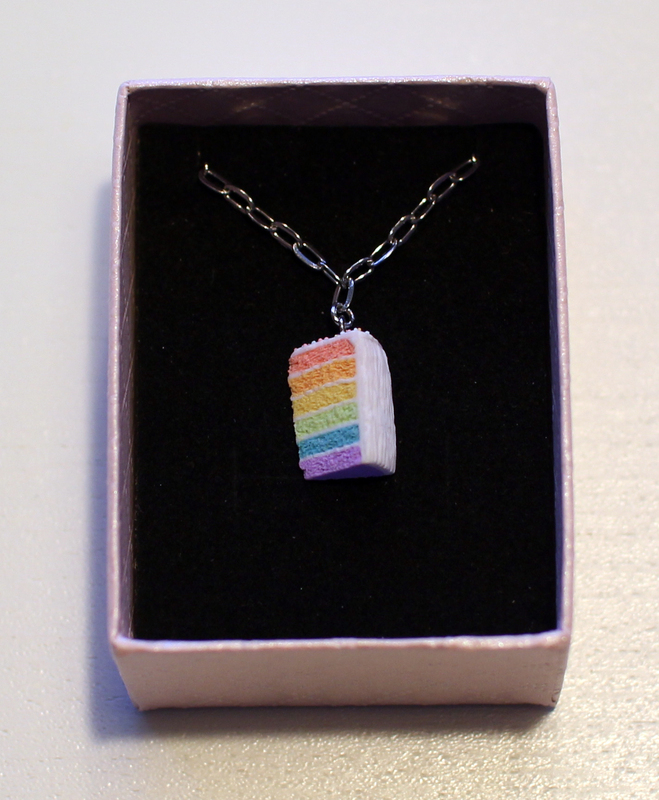 As mentioned the prize was a bracelet with a slice of rainbow cake. And wauw! Jocelyn even made the bracelet a lot longer for me (I have fat wrists), so it fits, which is pretty neat! Such cute packaging! A little note and card with pictures of AiClay’s products and of course the beautiful box with my bracelet! My hand will never be a model. But the bracelet is gorgeous! Because we all need you know some of that jewelry! 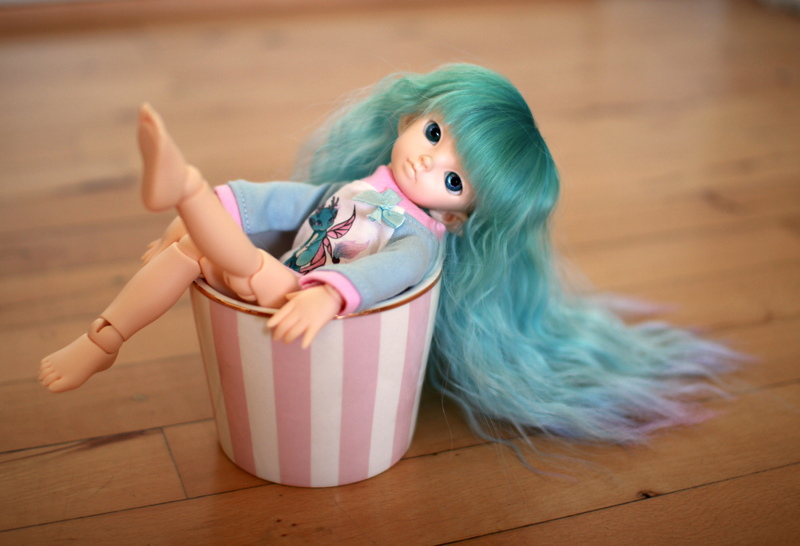 As mentioned here I recently purchased 3 wigs from Leeke World – all three of them are ART wigs. It took them a while to get home, but that was mostly the fault of the Danish customs services. The Art Fairy was purchased with Ozzie in mind. Just like the other wavy wig I purchased (Winter) it was so incredibly soft that I basically wanted to rub my face against it. My husband arrived home to find me with the wig in hand and just stroking it. I want my cat to be as soft! I didn’t brush it, because I still haven’t located my toothbrush and I hate having to haul everything out of the closet it’s currently in. I really want that cupboard for my girls… It has a bit of fly-aways, but I doubt a lot of brushing would help. Maybe some sprays of water or wig tamer or something, but I have none of that lying around (well, I do have water…), but it still photographs very well. The only problem is the stray hair that insists on getting in her face, and unless that one starts marching in a row with the rest, I’ll yank it out. This one had bangs in her face as well, and I just couldn’t make them look good in any way, so I grabbed my tiny scissors and went at it. It’s not as good as it could be, but it’s also not horrible. I actually read somewhere on Tumblr that wigs (doll and human alike) are actually made with bangs too long, so you’re supposed to trim them! Well that’s a mystery solved in my book. 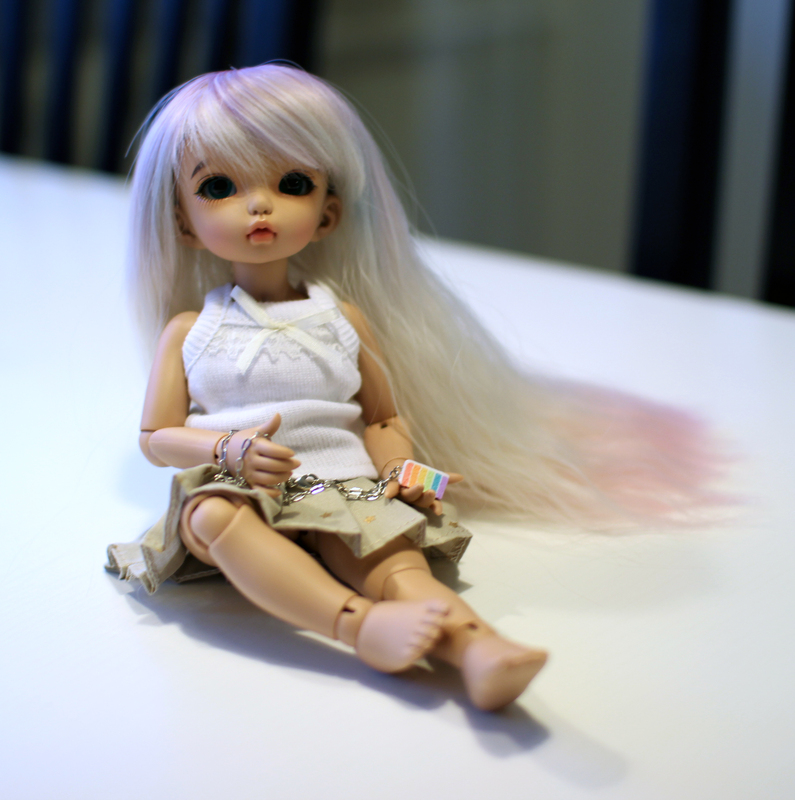 The color in Leeke’s pictures is quite accurate, and the wig is so beautiful in real life. There’s something very magical about all the Leeke wigs I’ve received in this batch – they have a unique quality to them and I enjoy them a lot. Plus I’ve been lucky enough that all the wigs are just perfect for their character. 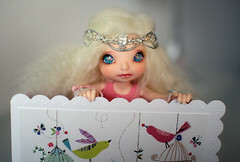 Well, I’m still on the fence about Cassie’s wig and tan skin, but who knows if Fairyland will even release tan skin again? As mentioned here I recently purchased 3 wigs from Leeke World – all three of them are ART wigs. It took them a while to get home, but that was mostly the fault of the Danish customs services. The Art Winter was purchased with Cassie in mind, and I was quite happy when it arrived. It’s incredibly soft. I just bought a new makeup brush from The Body Shop and I thought that was soft, but this wig is even softer! I want hair like that. I didn’t even brush it (mainly because I forgot where I left the toothbrush…), but it didn’t really seem like it would help a lot. Funny stray-ish hairs are just part of slightly curly wigs in my experience. It’s especially bad in the face area, and I might need to figure out some sort of way to keep it out of her face. Tucking the front parts in might be a good solution, since it looks very lovely with this wig. This wig has no bangs, which I’m quite grateful for. The bangs are just too long for LittleFees. The fit is quite nice though! As mentioned here I recently purchased 3 wigs from Leeke World – all three of them are ART wigs. It took them a while to get home, but that was mostly the fault of the Danish customs services. The Art Lavender was purchased with Kiri in mind, and I was quite happy when it arrived. It’s very soft and lovely. After brushing it a bit with a toothbrush (I read this tip somewhere, but I’m not sure it’s the best solution…it does create less static than a plastic comb though), about 8 hairs came out, and that was pretty much it, so it isn’t shedding like mad. The bangs are quite long for a LittleFee though. So is the length of the entire hair, as it reaches a bit below her knees. While I can trim the bangs, I would not recommend trimming the length of the wig, as you’d then lose the bottom colors. I think the colors are a little less impressive in reality than in the pictures, as I’m especially not seeing the green very much. But all in all I’m very happy, because it’s such a beautiful wig. Plus it really suits Kiri’s skin tone!